We have fallen behind on our blog posting, so I am going to bring it up to date and try to be more diligent going forward. John and I are both doing great. He has lost about 90 pounds in the past year just following our new style of eating. I, on the other hand, continue to lag behind, in spite of all my bicycle riding. I’ve only lost 58 pounds. Nevertheless, I think we will both reach our goal in another year. Then we will move into our maintenance phase. Since this isn’t really a diet anymore, we both feel our life style changes will make maintaining our weight easy in the future. After our December trip, we decided it was time to go ahead and set the boundaries around our property in Atenas. We decided to build a 2 meter, concrete wall between us and our neighbors on the west side and a 1 meter, concrete wall on the other 3 sides. We will still have a great view, because we are installing 1 meter of fence on top of the low walls. In the future, we will probably replace this fencing with decorative wrought iron. We got a couple of proposals and it turned out cheaper to have the same guy that built our casita, build the wall too. He is a Civil Engineer and it’s great to work with him. He won’t let his crews take any shortcuts and when he is done it’s a quality job. In January, we went to California to meet the latest addition to the clan, little Charlotte. Talk about a cutie! She is such a good baby too. While we were there, we managed to squeeze in a mini family reunion with my sisters and their families, Aimee, Keith and their kiddos, and of course, Chris, Jen and baby Charlie. It was so good to see everyone. I spent January and early February cooking lunches and dinners for John. I vacuumed sealed meals and froze them so it would be easy for him to continue to eat right while I came to Costa Rica to oversee the construction. I arrived in Costa Rica a week ago and the wall construction is now well under way. 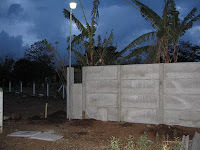 Once we have the wall in place, we plan to install an automatic watering system and a lawn. Right now, the property is barren and it will be nice to see a lush lawn and plants the next time we come down here. Once of nicer things about Costa Rica is the cost of medical and dental care, coupled with the outstanding quality. While I’m here, I’m getting some dental work done that I’ve been putting off. I can have the same work done here for 1/3 of what is would cost in the States. The downside of being is Costa Rica…… I really miss John and I can’t wait to be home with him soon. Hello my name Is Rosa and I work as the Admin. Assistant at Wachs Subsea, I work with your husband John, I wanted to tell you that I am in AWWW that you prepared all of John's food before you left what a blessing! I can not wait to meet you when you get back.